All About Vision - A guide to eyeglasses, frames, lenses, contact lenses, sunglasses, LASIK, refractive surgery, sports vision, low vision, eye safety, other vision conditions and vision correction options. Ben Vision Research - Develops and commercializes diagnostic technology for eye doctors and enhancement products for partially sighted individuals. Beyond 20/20 Vision - Discover natural ways to improve your vision and decrease your dependency on eyeglasses, contact lenses and eye medications, all without corrective surgery. Blind Readers Page - A guide to sources of information in alternative formats (braille, recorded cassettes, large print, e-texts, web audio) accessible by people with print disabilities - those with visual and physical handicaps as well as dyslexia. It is also a guide to information about blindness, visual handicaps and other physical handicaps (with a special focus on Wisconsin resources). Career Assistance for the Blind and Vision Impaired - This guide offers job seekers with vision impairments a one-stop shop for information and other resources, including legal rights, to help them jumpstart their careers. Computer Vision Homepage - Established at Carnegie Mellon University to provide a central location for World Wide Web links relating to computer vision research. Eye Cancer Network - Diagnosis and treatment of ocular tumors, eye cancer, and orbital diseases. 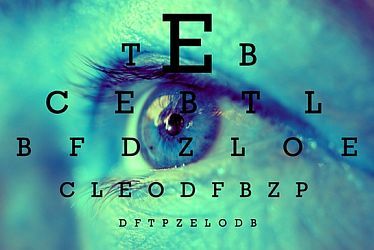 Eye Information A to Z - From St. Luke's Cataract and Laser Institute. GlassesOff - A mobile app program for both iOS and Android to train your near vision performance. How to Read Your Eyeglass Prescription - The basics from Gary Heiting, OD. Internet Ophthalmology - Devoted to the education and training of international eyecare providers. MEDLINEplus: Eye Diseases (General) - Extensive resources. Kellogg Eye Center - State-of-the-art medical and surgical eye care. Highly respected residency and fellowship training programs. Leading-edge research aimed at improving therapies for ocular disease. Laser Eye Surgery - Information on excimer laser eye surgery, photorefractive keratectomy (PRK), and other refractive eye surgery such as RK, ALK and LASIK. LaserVue Eye Center - San Francisco Bay Area LASIK specialists. LASIK Institute - Promotes the LASIK procedure for refractive surgery. Age-Related Macular Degeneration Overview - Information from WebMD. Facts About Age-Related Macular Degeneration - Information developed by the National Eye Institute. Macular Degeneration Education - Information about macular research, information and advocacy. Price of Sight: Ranibizumab, Bevacizumab, and the Treatment of Macular Degeneration - Article by Robert Steinbrook, M.D. (N Engl J Med 2006). Wet AMD Treatment Options - From AMD Partnership. Wet Macular Degeneration - There are two basic types of macular degeneration: "wet" and "dry." Approximately 10-15% of the cases of macular degeneration are the "wet" (exudative) type. Medical Blind Union - The internationally recognized organization, representing the 285 million blind and partially sighted persons in 190 member countries. The voice of the blind, speaking to governments and international bodies on issues concerning blindness and visual impairments in conjunction with its members. National Eye Institute (NEI) - As part of the U.S. federal government's National Institutes of Health, the NEIs mission is to "conduct and support research, training, health information dissemination, and other programs with respect to blinding eye diseases, visual disorders, mechanisms of visual function, preservation of sight, and the special health problems and requirements of the blind. Also see Resources page for help in finding low vision specialists, services and other information. New York State School for the Blind - Providing education to the children of New York State who are visually impaired and have multiple disabilities. Ophthoguide - Medline and Internet search engine for ophthalmology. Visual Impairment Centre for Teaching and Research - Social research and teaching in the area of visual impairment. Visugate - Visual impairment information. Viteyes - Formula eye vitamins for ocular nutrition and eye health. This webpage last updated on Sunday, July 9, 2017 2:54 PM.